With the arrival of May the arrival of one rod fishing has come. The past week's striper fishing on Lake Texoma has definitely been the best of the year. I have spoken to several other guides who all agree that fishing is at a peak right now. Fish are grouped up in good schools and on the feed. I'm anchoring down in 40-70 feet of water in the river channel west of the Hwy 377 Willis Bridge all the way to Washita Point and am finding fished stacked like cord wood. Although I seldom fish north of the Washita point area, I have heard that the fishing conditions are the same all the way to the Hwy 70 Roosevelt Bridge. Live bait is the ticket for catching a limit of stripers right now, but with the size of some of the schools I've seen recently, I'm itching to try using a slab on them. This past week we've tried using topwater lures with some success on wind blown banks and points. But as far as schools on top, I've only seen one up and on top only briefly. 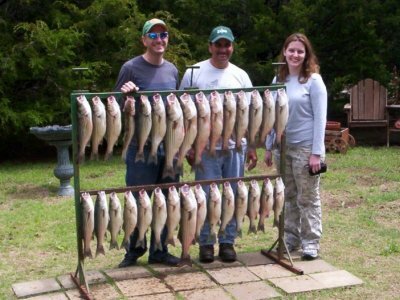 While out fishing Lake Texoma, be sure to take a bump board or some type of measuring device to check the length of your catch. The daily limit of stripers on Lake Texoma is ten per person with only 2 stripers over 20 inches or longer. Be sure you check the length of the fish you catch.